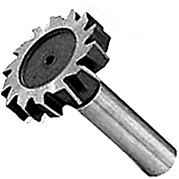 Made for tooling to mill internal keyways, a Keyseat Cutter is a common tool bit type of endmill. Endmills are a type of rotating cutting tool that have teeth at their end. They can be used for roughing and finishing in a variety of materials. Endmills can be coated for heat dissipation or uncoated to lower unit cost in materials where overheating isn't a crucial factor, such as in aluminum and softer materials.